Each year, Open House brings in approximately 3,000 people to the College of Veterinary Medicine (CVM) on a designated Saturday in April. There are more than 50 exhibitors. Attendees include families, prospective applicants, Veterinary Health Center clients and the general public. This event serves the community by educating members of the public about animals and public health. It is run by veterinary students with the assistance of faculty, staff and house officers as a service learning event. The Dog Days summer camp is operated with members of 4H organizations for 12-16-year-old students. The program reaches out to children to encourage and support interest in the veterinary profession. The Advanced Veterinary Academy is designed for 16-18-year-old students who have had some veterinary experience. The program provides students with in-depth experience in veterinary science. This partnership between the Boone County Fire Protection District and MU CVM brings together the expertise and skills of firefighters and veterinarians to facilitate safer, faster rescues of trapped animals, thus ensuring the health and well-being of both the human responders and the animal patients. CVM faculty offer continuing education workshops and lectures and online programs to help veterinary health professionals and farmers in Missouri stay current with the latest developments, skills and new technologies required in their fields. Faculty travel across Missouri to teach Food and Drug Administration veterinary feed directives and biosecurity in swine and poultry farms in order to promote the responsible use of antibiotics for food-producing animals and ensure safe food and sustainable use of antibiotics for animals and humans in Missouri and the United States. This service helps to prevent disease spread within and between farms, thus promoting animal agriculture in Missouri. Pet-Assisted Love and Support (PALS) is a volunteer student club with faculty, staff and community involvement. With their pets, volunteers visit hospitals and senior citizen centers. The impact is significant, not only for those being visited, but for the formation of empathetic veterinary students. In fact, some students form programs similar to this in the communities they go on to serve as doctors of veterinary medicine, and many of them stay in Missouri. The team works with cat breeders and owners to promote genetic health. Members of the laboratory visit with breeders and owners at cat shows and special seminars to discuss healthy breeding practices and to develop research projects that will determine the cause of specific health problems in cats. The overall impact is to prevent genetic diseases and promote healthy breeding practices for cats. A partnership with various breed clubs offers genetics tests and education about genetic diseases in their breeds through websites, club newsletter articles, and presentations to the club and the Saturday Morning Science series. Since the group first eliminated x-linked ataxia from English pointers in the early 1990s, they have found the mutation responsible for more than 20 hereditary neurologic diseases in dogs. This provides breeders with a DNA test to identify carriers and eliminate the disease from the breed. Research is now being conducted on gene therapies for two of these diseases, and one of the therapies developed is now in clinical trials in children with the comparable disease. The program helps to increase the awareness of genetic diseases and promote healthy companion animals in Missouri. A collaborative effort between Homeland Security, state government agencies, industry and universities, this committee shares information concerning the biosecurity and biosafety of Missouri and the country to help keep Missourians safe. The Mule Club cares for the Missouri Mule Team, which are the mascots of the MU CVM. The mascot mule team travels to approximately 50 events across Missouri each year and educates the public on the unique role that this hybrid animal played in the economic and cultural development of Missouri. This program provides medical care to hawks, owls, eagles and vultures that have been injured, with the goal of returning them to the wild. The group also puts on educational programs at schools and other venues. The program saves wild animals and educates the Missouri public about the role that raptors play in Missouri’s ecosystem. Through the program, MU faculty developed the Lameness Locater, a commercially successful body-mounted inertial sensor system to detect and evaluate lameness in horses. Equinosis is the faculty startup company with offices in St. Louis and Columbia that was founded to further develop and sell the Lameness Locator. Other commercial products are in development. The TigerPlace Pet Initiative holds a weekly animal visitation called PAWSitive Visits in which animals of varying species are brought to TigerPlace and a tutorial is given to residents about the animal. The program also provides pet matching/adoption services for older adults; and pet care assistants who bathe, give medications to residents’ pets, walk dogs, assist with cat box cleaning, transport pet supplies, and transport pets that need treatment at the Veterinary Health Center; and monthly pet house calls by a student and CVM faculty veterinarian. In collaboration with Veterans United Home Loans, we are training service dogs for U.S. military veterans with post-traumatic-stress disorder. The dogs come from animal shelters, undergo pre-training in basic obedience at the Boonville Correctional Center, and then are trained on special skills to help veterans. The program matches the veteran with the dog through careful assessment. The program has trained and placed dogs for five years, but this collaboration with Veterans United Home Loans extends our reach considerably. The programs provide veterinary technicians the opportunity to complete a bachelor’s degree online, or to obtain a master of science degree. Graduate veterinarians may earn a master’s degree. Programs also provides pre-veterinary elective courses online. The programs provide professional level advanced veterinary training to Missourians while they maintain their principal residence and employment. As the first online programs in the country to offer college credits at the undergraduate and graduate level taught through a college of veterinary medicine, it brings Missourians national recognition in higher education. Each year the service provides free ophthalmic exams to service dogs in Missouri as part of the American College of Veterinary Ophthalmologists outreach program. This helps to preserve the sight of those animals who serve Missourians, strengthens referral relationships with general practice veterinarians, and benefits Missourians who rely on service animals. The program provides the highest standard of medical and surgical care to equine patients in the greater Columbia area. This includes routine preventive care and vaccinations, lameness problems, dental issues and care of the breeding mare and new foal. Clinicians frequently provide seminars, as well as question-and-answer sessions, to numerous saddle clubs and other horse-related organizations. The clinicians also volunteer with the Large Animal Rescue Team. The Equine Ambulatory Service clinicians also visit the Longmeadow Rescue Ranch, a branch of the Saint Louis Humane Society, monthly to provide preventive care, lameness care and address a variety of health issues. The program offers a variety of on-the-farm services, from individual animal care to herd health. The service sees approximately 10,000 cases each year with the caseload derived from commercial farming operations, university farms, and the Mexico, Missouri, Livestock Exchange. We also provide veterinary services to the State Fair and the American Royal. The service has an impact on livestock health, well-being and productivity as well as protection of the food supply and public health. The program provides preventive medicine and spay/neuter services to approximately 130 shelter animals per month throughout mid-Missouri. The service saves lives by preventing disease outbreaks while providing expanded hands-on learning experiences to veterinary students. The Small Animal Emergency and Critical Care Service provides emergency and critical care for small companion animals 24 hours per day, 365 days per year. The clinic sees approximately 15 to 20 cases per day and an average of 16 cases per night in the intensive care unit. The program provides 24-hour 365-day accessibility to tertiary emergency and critical care for horses and ponies. The satellite clinic provides convenient care for St. Louis-area clients whose pets need evaluation and potential treatment for cancer, behavior, dermatology or advanced diagnostic imaging. The weekly Resident-Intern Seminar Series regarding current topics in veterinary medicine and surgery, is open to veterinarians and veterinary technicians and is a RACE-approved continuing education provider. The program helps Missouri veterinary professionals to stay current with the latest developments in medicine and surgery. The Veterinary Medical Diagnostic Laboratory (VMDL) is Missouri’s only AAVLD-accredited veterinary laboratory. It is a full-service diagnostic lab for all animal species. The laboratory serves veterinarians, producers and owners as well as federal and state government agencies. The VMDL serves Missourians from 110 counties and clients from 44 other U.S. states. The VMDL annually performs 100,000 diagnostic tests to support Missouri’s animal agriculture and companion animal sector, as well as wildlife and zoo animal conservation. The VMDL is a Level II member of the National Animal Health Laboratory Network (NAHLN). The NAHLN provides a framework for the coordination of federal and state animal disease diagnostic laboratory infrastructure, capabilities and capacities. The VMDL monitors antimicrobial resistance and various emerging, re-emerging and foreign animal diseases, including avian influenza, exotic Newcastle disease of poultry, swine influenza, foot-and-mouth disease, classical swine fever, porcine epidemic diarrhea, pseudorabies and Senecavirus A. The in-state testing capability and rapid communication with industry and state and federal government officials play a critical role in safeguarding Missouri’s livestock, poultry and wildlife. The VMDL is a Tier I Lab of the Food and Drug Administration (FDA) Veterinary Laboratory Investigation and Response Network (Vet-LIRN). The Vet-LIRN investigates potential adverse events involving animal feed and drug contamination or adulteration. The program has been collaborating with FDA to investigate outbreaks related to contaminated feed and drugs. The program has collaborated with FDA to develop and validate detection methods for a variety of pathogens and agents, such as Campylobacter and Salmonella spp. Through disease investigation and methods development, the VMDL helps to reduce adverse events related to feed and drug contamination, thereby increasing the safety of humans and animals in Missouri. The VMDL collaborates with the Missouri Department of Health and Senior Services Epidemiology Unit to monitor and investigate multiple diseases that affect both animals and humans, such as West Nile virus, tularemia, anthrax, rabies, and vector-borne diseases. Through monitoring zoonotic diseases and developing detection methods, the VMDL helps to protect and promote the health and safety of Missourians. VMDL faculty provide free consultation to veterinarians, farmers, owners and the poultry industry in Missouri about disease diagnosis, control and prevention. The VMDL faculty provide free phone consultation on a daily basis. The faculty also regularly visit clinics and farms and present information at local and state events. The availability of these consultations and other regular outreach activities have greatly helped Missouri veterinarians and farmers better manage cases and the health of individual animals, herds and flocks. Monthly continuing education seminars are open to veterinarians and veterinary technicians through a RACE-approved continuing education provider. The program helps Missouri veterinary professionals to stay current with the latest developments in medicine and surgery. When injured stray pets are presented to the Emergency and Critical Care Service by members of the local community, clinicians try to provide basic stabilization, and when possible identify owners. This allows pets to go to a local humane society to give them the best chance to be reunited with their families. 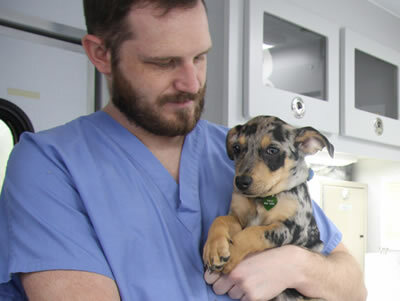 The University of Missouri Veterinary Health Center’s three hospitals provide state-of-the-art teaching and medical services. In addition to regular check-ups and preventive health care for companion animals and livestock, we feature specialized treatment such as emergency medicine and critical care, internal medicine, soft tissue surgery, dentistry, ophthalmology, neurology, oncology, dermatology, cardiology and orthopedic surgery. Veterinarians throughout the Midwest refer patients to the VHC for specialized diagnoses and treatment. With sophisticated therapeutic equipment, advanced imaging and groundbreaking diagnostic methods, we are a regional center for animal health care. Veterinary students organize an annual fun run and walk that is open to the whole community and serves as a fundraiser for the Central Missouri Humane Society. Together in Grief, Easing Recovery (TIGER) provides a safe space, assistance and support to individuals and families during the emotional period from diagnosis through illness progression to death of a pet. Topics addressed through the TIGER program include: end-of-life concerns, anticipatory grief, how to talk to children about animal health and death, ways to memorialize the special bond with a companion animal and resources to help people cope with the loss of their animal. A grief counselor is available to speak with animal owners, and training is offered to faculty, staff and students. The college participates in this event to answer questions from the public about pets and the Veterinary Health Center. Barkley House offers pet-friendly lodging for families whose pets are receiving treatment at the MU Veterinary Health Center.